For any business or cooperation project with China, understanding the Chinese business environment is cardinal to success. Cooperation between the West and China means dealing with two different economic, legal, political, social and cultural contexts. The first step for efficient cooperation is to understand each other’s logic, only then strategic decisions can be taken. The Wall Behind China’s Open Door has proved to be an excellent guide for anyone working with China. 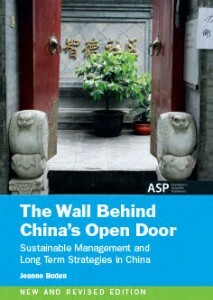 This second, improved and updated edition again provides in-depth insight in how to successfully do doing business with China.